Next week is the fiftieth anniversary of President John F. Kennedy Jr’s assassination. Networks are airing retrospectives and publishers are releasing new books that look at this pivotal national event. Today, The New York Times writes about one of the signature artifacts of that day: Jacqueline Kennedy’s Chanel-inspired pink suit. Having done archival research and having touched everything from letters signed by Napoleon III to journals written by grieving widows eager to preserve their husband’s place in history, I have a sincere appreciation for historical preservation, as it helps future generations gain a better understanding of their past, hopefully so they can enrich their future in some sort of way. Having said that, Jackie’s neatly tailored suit (still caked with her husband’s blood) has been out of view since that fateful day in November 1963 and the Kennedy family wants it to stay that way until 2103. 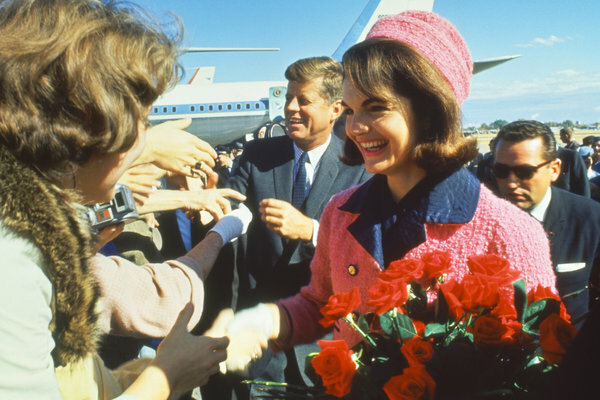 Displaying Jackie’s suit in a similar fashion would produce “hysteria,” it was believed, so it will sit in a climate-controlled vault for at least another century. In the meantime, pictures and video clips remain. What does Jackie’s pink suit signify for you? Or, can you think of another historical artifact that has as much resonance? If so, what is it and why do you find it significant? Leave your answers in comments below.